Did you know that the first pies were often made from pastry that was intentionally barely edible? Pastry was used as a method of keeping meats and fillings moist during cooking and also to seal the filling to keep it from spoiling. YUM. Many believe the term "pie" has its beginnings from "magpie", a bird that collected a variety of different objects. The Chicken Pot Pie was the first frozen pot pie available in the US, developed by the Swanson Company in 1951. As the saying goes, the rest is history. With a few store-bought ingredients and some fresh veggies, you can make a delicious home-made chicken pot pie in about 30 minutes. Rotisserie chicken can be a life-saver for a quick dinner. It's moist and juicy, and all the work is done for you. I bought just a whole breast and only used half of it for these four pot pies. You can double the recipe for a larger family. In a medium saute pan, melt butter and olive oil over medium heat. 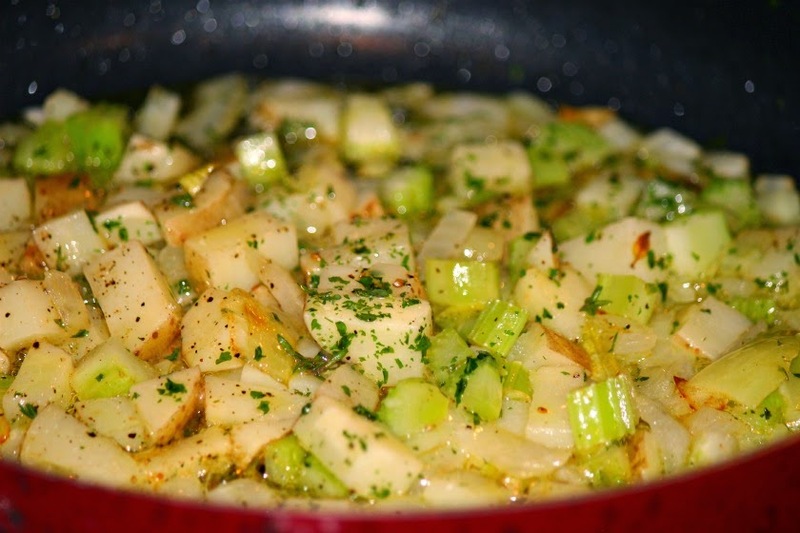 Add onion, celery and potatoes and saute until onions and potatoes begin to brown slightly, about 5-7 minutes. Add salt, pepper, parsley and thyme. Stir in flour and stir to combine. Cook for 2-3 minutes to cook the raw flour and it begins to smell toasty. 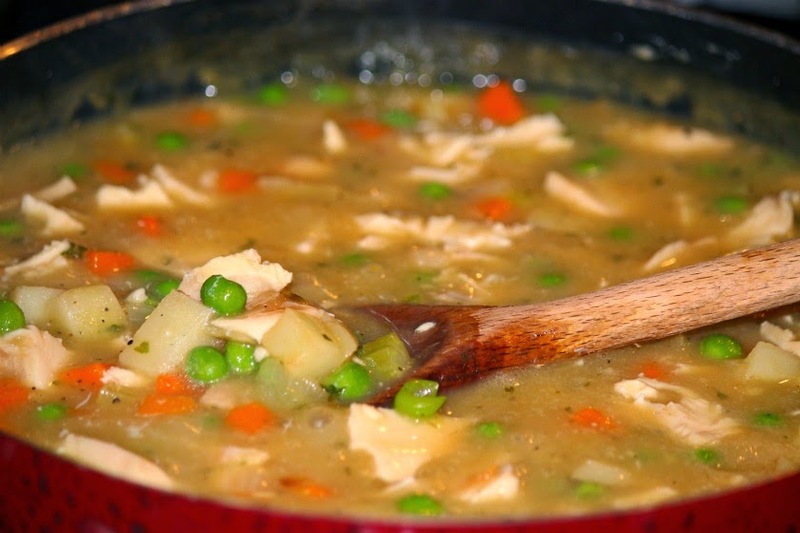 Add chicken stock and peas and carrots and bring to a simmer. Simmer 5-10 minutes until thickened and vegetables are tender. Remove half of chicken breast and cut into chunks. Stir into gravy. Add any accumulated juices left in the container from the chicken. 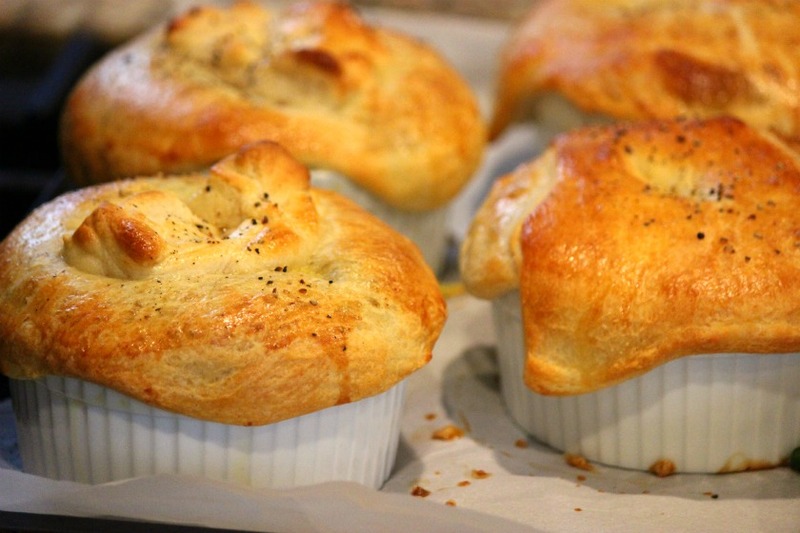 Preheat oven to 375 degrees F. Divide filling among 4 ramekins and fill them up to the brim! Remove dough from package. Roll out and pinch together perforations. Roll out slightly to measure 8 inches across. Cut four squares measuring 4 x 4 inches. 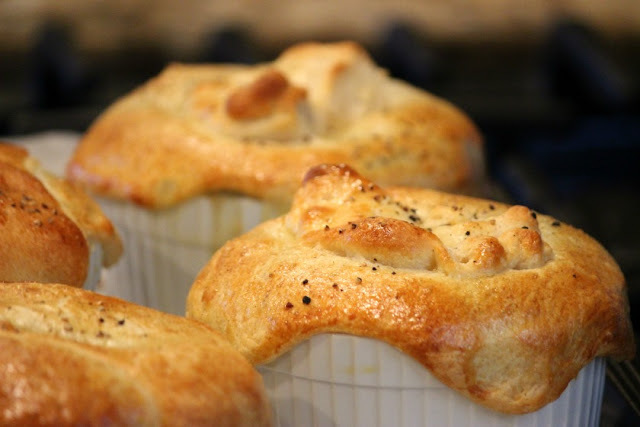 Drape over filling, stretching slightly so dough hangs over the edge of the ramekin. Brush with egg wash and top with Sea Salt and freshly ground black pepper. Bake 10-12 minutes until golden brown and filling is bubbly. How easy was that? Let cool slightly before serving. Makes 4 generous pot pies. 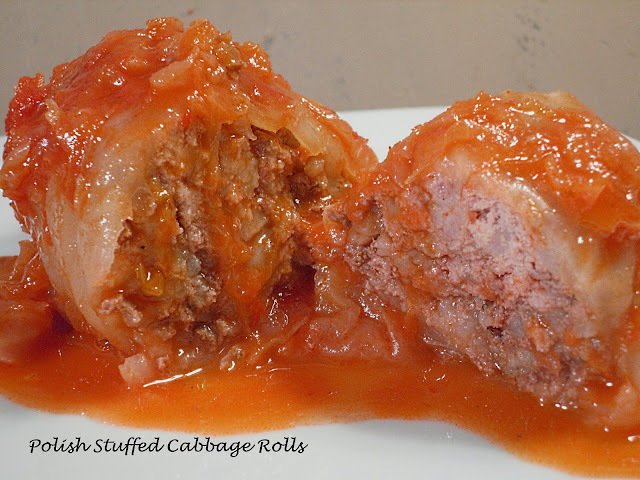 these look super good and easy! Thank you! Next time I'm going to double the recipe - they went quick! Thanks Lynn! 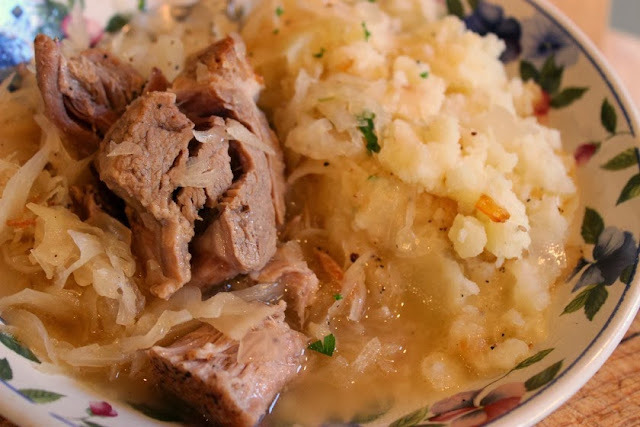 Would also be great with leftover turkey that's coming up! They were a winner Catherine! This one is a keeper! Thank you Alyce! Happy weekend!